EAW015492 ENGLAND (1948). Billingley, Open Cast Coal Quarry south of the village, 1948. This image has been produced from a print marked by Aerofilms Ltd for photo editing. 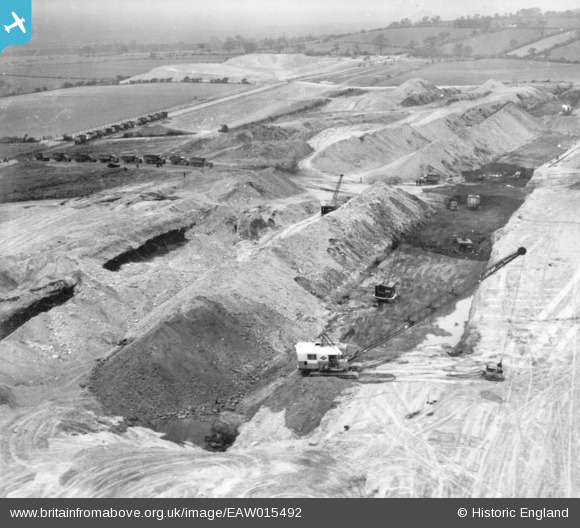 Pennawd [EAW015492] Billingley, Open Cast Coal Quarry south of the village, 1948. This image has been produced from a print marked by Aerofilms Ltd for photo editing. This could be a fairly high railway embankment. The Darfield to Wath upon Dearne railway. Is this some sort of spoil heap in the distance? I think I can see it on some of the other pictures too. For my money this is opencast coal mining somewhere in Yorkshire, Derbyshire or Nottinghamshire. This looks like hard work!- to locate as well as on the ground. I think that I'll try some more likely ones for now. I think that you are on safe ground in thinking that this is an open cast coal mine. There are however an awful lot of coal mining areas in Britain and most of the evidence is removed when the ground is reinstated after the coal has been extracted.